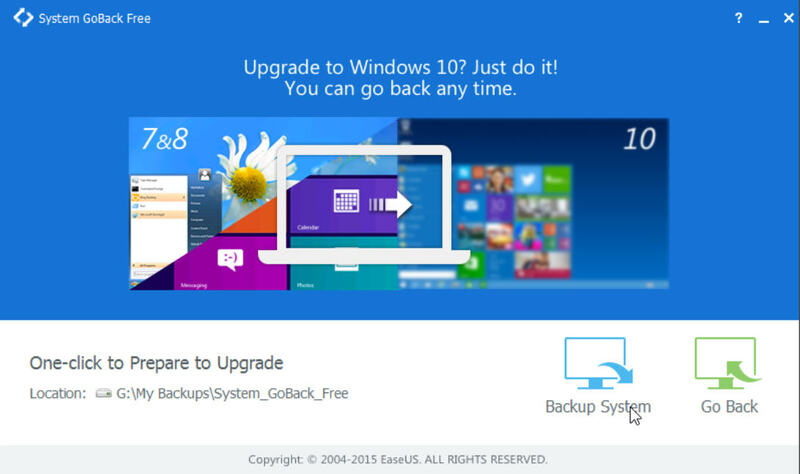 EaseUS has released System GoBack Free 1.0, a tool aimed squarely at those about to upgrade to Windows 10. The stakes are high for Microsoft’s new OS -- it’s a free update to many, but those who have reserved their upgrade may be getting twitchy ahead of the big day. System GoBack Free aims to soothe their nerves by offering an easy fallback option. System GoBack Free makes it easy to take a full system image of the user’s computer prior to them upgrading to Windows 10. If they subsequently want to roll back to their previous version of the Windows, the app makes it easy to do so. It’s aimed squarely at Windows users who don’t want the hassle of discovering how to use Windows’ own built-in system image tools, or who haven’t made use of a third-party tool like Macrium Reflect. System GoBack Free is designed to make the process as hassle-free as possible. And despite the fact it’s targeted at Windows 7 and 8 users, it’ll work with XP and Vista too. First, download and install the app -- it’s a hefty 80MB download. Once launched, you’ll see that System GoBack Free has just two buttons: "Backup System", for taking your pre-upgrade backup, and "Go Backup", which you’ll only need to use if you subsequently decide that Windows 10 isn’t for you (or something drastically goes wrong with the update process).Take a note of the Location path -- this is where System GoBack Free will save your fail-safe image. Everything works as you’d expect it to -- a progress bar keeps you informed as to the backup’s progress, and once it’s complete, you have a fall-back option should you fall out with Windows 10. Our big issue with System GoBack Free is that in attempting to be as simplistic as possible it’s actually dropped the ball. There’s no option to pick and choose your backup drive, for example, and while the app provides an emergency boot image in the form of an ISO file (look in the program’s bin folder), it’s not created by default as part of the backup process. Instead, the user must burn this to disc or create a boot USB manually. Failure to do so means the backup is of little use if something goes wrong during the upgrade process and Windows becomes unbootable. If you can live with these drawbacks, then System GoBack Free 1.0 is a freeware download for PCs running Windows XP or later.